This is just a small example of what is referred to as a “Digital Dumping Ground” in countries such as Ghana, China, India, and Vietnam. It represents what globalization means to me mainly because it represents the negatives of increased technology development and of the easy distribution of goods. Developed countries such as the UK and even the United States have been found to “dump” their electronic wastes in areas such as the ones previously mentioned. There are laws working to control this distribution but countries are often able to bypass them by labeling the waste as donations. The minimal good that comes from this action is the fact that some of these “donations” make it to less fortunate people in developing countries, but more than half is left as waste. 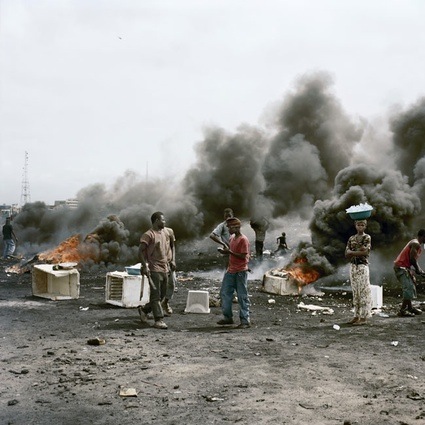 This poses many health threats to the citizens of developing countries as many try to burn the materials to extract precious metals to attempt to make a living. The fumes from this burning will eventually lead to death. In many cases what was once natural area, such as wetlands, becomes covered with this garbage, which works to completely transform an area for the worse. I think that, though globalization has many positive outcomes, this negative affect needs to be monitored much more closely and fixed as soon as possible. It’s honestly pretty disgusting that we, as the United States, can just disregard the biproducts of our wealth in exchange for the lives of those in struggling countries. More information is available in the video posted below. 1. Why the lessening of transportation costs, made possible by the railroad, the car, and the telephone, worked to strengthen city centers rather than diffuse wealth? This question is important because the very origin of globalization stems from the expansion of transportation methods. It is also important because once we can figure out why wealth is not being diffused like it should be through the ample amount of transportation systems, the distribution of wealth can become more even and the value of life of many people in third world countries can be imporoved. With this being the case, the anwering of this question is especially important to those in third world or impoverished regions of the world. 2. How do the effects of modern globalization contribute to the high population growth in third world countries? This question, like the first, is an important one to ask because it has to deal with the bettering of life in less fortunate areas of the world. The population of the world is supposed to reach 9 billion by the year 2050, an amount of people that our rapidly depleting resources cannot handle. This growth of people is mainly coming from third world countries where having many children is either financially helpful or somewhat impossible to avoid due to a lack of education. With this problem solved, or at least lessened, the entire world population will benefit. 3. How can the exploitation of poor workers and of the resources in poor countries by wealthy countries be stopped? This last question, though slightly more specific than the previous two, is just as important. Though globalization has resulted in many positives, the exploitation of poor countries by wealthier countries and of resources by countries across the globe is one of globalization’s down sides. With the population growing, the need for ample resources is growing and while we are wasting those resources we are only graying our futures. By taking advantages of human resources in poorer countries we are doing practically the same thing. Those countries cannot be expected to survive with the poverty level and mistreatment they are made to endure and, though wealthier countries may be better off in the present, as soon as one link in the global economy breaks they will all begin to fall apart. In this sense, answering this last question is important to all nations around the world. I was doing my reading for my sociology class when I came across a famous sociologist named Harriet Martineau who lived from 1802 until 1876. What first struck me was the title of one of her books: Theory and Practice of Society in America, which was written about the physical and social aspects of our nation including the method used to raise children. I thought that was pretty interesting (and possibly controversial) and so I went to the internet to search the book hoping to find some sort of excerpt to read that would successfully quench my curiosity as well as aid me in stalling on my reading. Well, my search was a bust. I found no such excerpt and I was left reading a wikipedia article on her works throughout her life. It turns out she translated the works of another famous sociologist, Comte, into English. Okay, so my point then that relates even the slightest bit to globalization and the point that sparked my interest in digging out the ever-complicated umw blogs password (that I really need to change) to post this blog late at night is that globalization has been and will continue to be an on-going constant in the world. Even in the 1800s globalization was occuring with the transfer and acceptance of not only foreign texts but foreign ideas. I think that this sort of exchange happens all the time whether it be through books, as it was in this case, or other forms of media. What one French man proposed sparked the interest of an English woman which sparked her participation in the field of sociology and of the discussion of ideas, which then sparked the interest of the people who read her books and the students she eventually began to teach, and so on and so on. Globalization, though its most concrete examples lie in economic standings and political platforms, really seems to originate from pure thought. The spread of anything, even, originates in thought. And, because man has always been and will always be capable of thought, globalization has been and will always be a phenomena working to shape the way we see the world. When I think globalization that first thing that sticks out to me is the root of the very word “globalization” : global. So, as my thought process progresses, I think that if something is global that means it applies to the entirety of the globe, to the entirety of the land, the oceans, the skies, etc. Globalization, then, is the forming of a unified front of different cultures and regions around the world to share the best parts of the their land, oceans, and skies with other cultures and regions who can then understand and appreciate those pieces of the globe and work in unison with the rest of the world to protect their beauty. For example, globalization could involve the transmission of images or knowledge about a virgin forest in South America to different continents on the globe. This transmission, then, would spark the interest of people that would have previously not known about the forest to protect said forest. Globalization could involve any transfer of information about any part of the globe because of the phenomena known as global communication that would allow for the knowledge of once only locally known areas of beauty to be spread all across the globe. You are currently browsing the Hannah's Thoughts blog archives for September, 2011.